In this day and age clean air is an inescapable issue for everyone. But for those of us who suffer from allergy, sinus, or asthma conditions, preventing unclean air is even more important. Weighing only 5 lbs., the Model 300 is ideal for allergy and asthma sufferers who also have a need and/or desire for a more portable air purifier. One of our most popular models, the Model 300 can be converted to a car air purifier as well, simply by using an optional auto adapter kit consisting of a cigarette lighter adapter and seat belt clip. The Model 300 portable air purifier features a medical grade HEPA filter that removes 99.97% of particulates 0.3 microns or larger (including pollen, mold spores, bacteria, viruses, and dander). An activated carbon inner blanket naturally removes gases, chemical fumes, and odors. For heavy duty removal of gaseous chemicals and odors, an optional VOC canister is available for your Model 300 portable air purifier. This breakthrough machine is available in 3 attractive colors: White, Black and Sandstone. 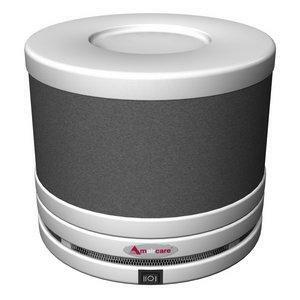 The Model 300 portable air purifier comes complete with filters and a 5 year warranty. Imagine the refreshing atmosphere of your room or car once this essential feature is added to it. Each Model 300 is quality tested three times using a laser particle counter during the manufacturing process. This is to ensure that HEPA filter specification standards are met and guarantees the removal of 99.97% of particles down to 0.3 micron all the time . Coverage Area: 250 sq. ft. (based on an 8 ½ ft. ceiling). Dimensions: 8 ½" round, 7 ½" high. HEPA Surface Area: 19 sq. ft. medical grade HEPA. Delivered Airflow: 40 CFM (cubic feet per minute) at highest setting. Control: 3 position, 2 speed switch. Power Consumption: 5 watts at highest setting. Optional VOC Canister: 12 months.